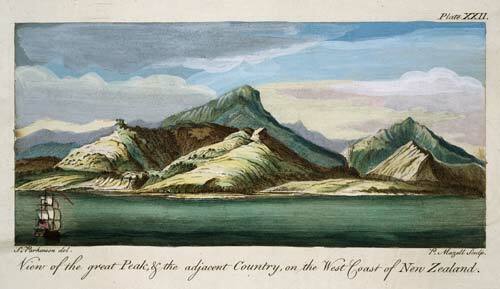 Sydney Parkinson sketched this view of the land around Mt Taranaki (Mt Egmont) in 1769, while accompanying James Cook on his first visit to New Zealand. The mountainous landscape was very different to England’s low rolling hills, which were familiar to Cook’s crew. Parkinson died in 1771, toward the end of the expedition, and his sketches were completed by others.